There are a lot of wonderful docks for your iPod on the market, but the iPort FS is unique in that it is but one component in a larger integrated system to distribute audiovisual content throughout your home. The FS stands for Free Standing, in contrast to the rest of the iPort line, which are IW or In Wall systems. The In Wall port is meant to be mounted flush into a wall, so you need to cut a hole in the wall to do that. It provides an elegant, customized look, but for folks who might want to start off a bit simpler the FS unit allows you to work with the system, without committing to remodeling dust. You can control volume at the iPort or switch from streaming music to syncing with iTunes at the push of a button on the dock. Because of its modular design, the iPort FS makes it easy to share your music or video content. There are some other distribution systems out there, but this is the easiest entry point on your wallet, and offers much more potential for growth than a simple docking station. The quality is first-rate, and there are several connection options available. 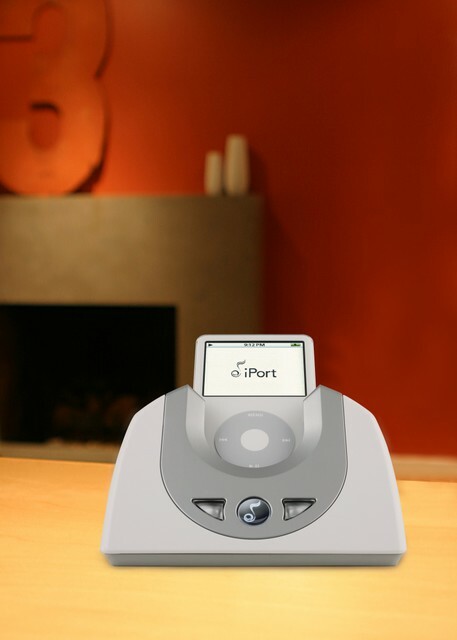 So, if you are thinking of spreading your music collection throughout your house, consider the iPort FS as a great starting point.